Trains ... bricks ... ferries ... troopships: the 7.1-mile Ferry Point Loop and linked Shipyard 3 Trail represent some of the most historic and scenic sections of the San Francisco Bay Trail. 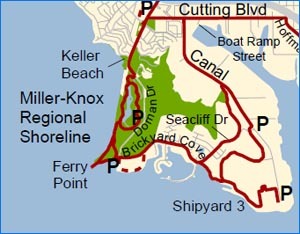 The Ferry Point Loop encircles 306-acre Miller/Knox Regional Shoreline and is adjacent to the Point Richmond Historic District. The Shipyard 3 Trail is located in Richmond’s Point Potrero Marine Terminal as part of Rosie The Riveter/WW II National Historical Park. Shipyard 3 is the only place where WW II ship building facilities remain in the U.S., i.e. six buildings and five dry dock basins. as well as the S.S. Red Oak Victory and a Whirley Crane used in the Kaiser shipyards. It includes overlooks from a hillside above the Point Potrero Terminal as well as the historic ship basins with engaging exhibits interpreting Shipyard 3’s role during WWII. 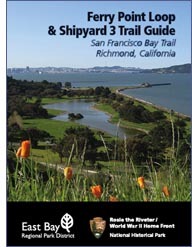 Click here to download the elegant Ferry Point Loop & Shipyard 3 Trail Guide. 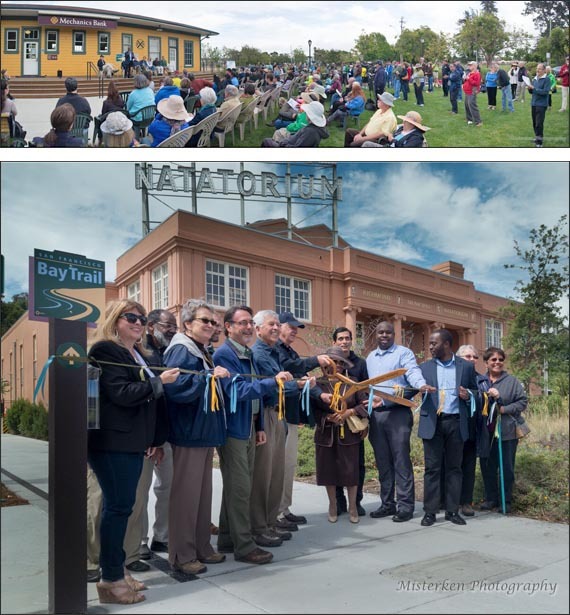 On May 31, 2015, the City of Richmond celebrated completion of the Ferry Point Loop Bay Trail on its lands with the exception of a shoreline section that will be built as part of the planned residential development on the City’s historic Terminal One property at the foot of Dornan Drive. Anticipating a great increase in local and regional bicycle traffic with opening of the Bay Trail across the RSR Bridge and Richmond-San Francisco Ferry service, the City has launched projects to make inland routes of the Bay Trail more attractive and safer for bicyclists. Protected bikeways and other improvements are being designed, thanks to about $1.3 million in funding by the Metropolitan Transportation Commission, Contra Costa Transportation Authority and Caltrans. A route to the RSR Bridge will be designated through Point Richmond, and the western end of the Richmond Greenway will be extended along Ohio Ave. to reach the Bay Trail. Short term improvements such as way finding signs and pavement markings will be installed prior to opening the Bay Trail across the bridge, and an extensive public outreach process is being launched for designing long term improvements. When completed, Shea Homes residential homes project as approved by the City Council in December 2014 will improve accessibility, safety and enjoyment of the Bay Trail built by the City along the shoreline between Brickyard Cove Road and the Shipyard 3 Trail along Canal Blvd. It will provide ADA access improvements where this trail meets the Shipyard 3 Trail and widen the narrow sidewalk on the eastern side of Seacliff Drive while also providing trailside amenities such as benches, interpretive panels, trash cans and dog waste bag dispensers. Despite celebrating completion of the Ferry Point Loop, a 0.5 mile shoreline spur section of Bay Trail remains to be built around the City’s former Terminal One property from the end of Dornan Drive looping back to Brickyard Cove Road. This will be built along with a shoreline park as part of a 316-unit residential development approved by the City Council in 2016. CLICK HERE for information on this project. 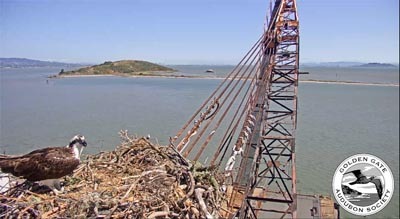 In July 2010, East Bay Regional Park District’s Board of Directors appropriated $1,177,000 of Measure CC funds for capital improvements in Miller/Knox Regional Shoreline to remove tracks, fencing and re-grade railroad right of way to provide public access from the park to the Bay and to Keller Beach, as well as to renovate the meadow area and remove silt & vegetation to keep the lagoon healthy. This has the potential to enhance access to the currently derelict mile-long western shoreline of the park and lead to an improved alignment of the Bay Trail. However, this project has been held up by a lengthy process to revise the Land Use Plan for Miller/Knox., which includes evaluating whether to breech the levee to San Francisco Bay or to leave the lagoon as it currently exists. 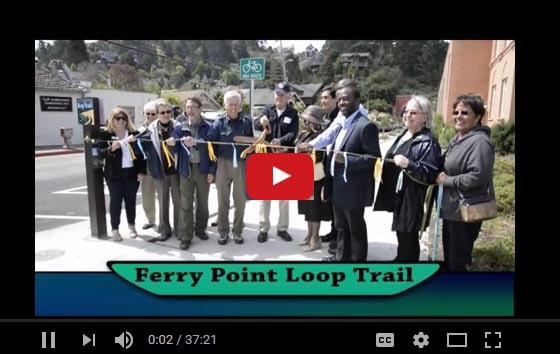 Click Here to view a slide show show of the Ferry PoInt Loop.